When you first meet L.A. Lawson, you know immediately that he has spent much of his life in the state of Texas. He has a distinct Texas drawl, and the lean look of a cowboy. His occupation, however, has been that of the modern Texan—working at laying pipeline. Sometimes for oil, sometimes not. He is no longer concerned with what the pipeline is going to carry—his main concern is that it’s going to be laid in a gold-bearing area of the western Sunbelt states! He works at this occupation only during the winter months. 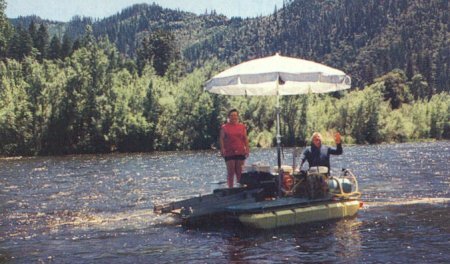 During the summer, he can be found dredging for gold on the Klamath River near Happy Camp in northern California. Actually, laying pipeline is only one of several occupations L.A. has had. He fell in love with scuba diving 22 years ago, and that naturally led to instructing. It also led to beautiful and exciting trips for him and his wife, Brenda, all over the U.S., and in various parts of the Caribbean. Scuba diving also led them to several diving industry shows, which is where they kept running into Mark Keene, of Keene Engineering. They eventually bought a couple of Dave McCracken’s videos from Mark, and were interested in learning more about dredging. It seemed an ideal complement to the diving they were doing. 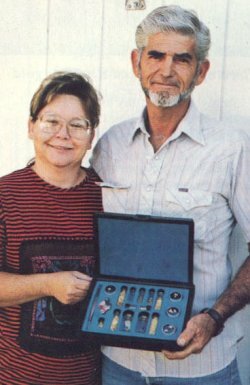 Their next contact with the pursuit of gold came when L.A. and Brenda went to Quartzsite, Arizona, to put in a gas pipeline. They became acquainted with a local miner who was not actively working his claim, but was interested in letting L.A. and Brenda work it. By this time, L.A. had begun accumulating mining equipment, which included a dry-washer and a motorized sluice. They started out dry-washing, but didn’t like the dust; so they figured out a way to use the motorized sluice in the desert: They transported a 55-gallon drum of water out to the claim each day, and used a succession of several drums to re-circulate their water. This was more fun! 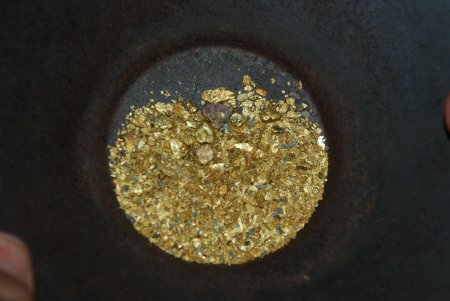 They found about 1 1/2 ounces of gold—not a lot, but they were beginners, and not many people even attempt to dredge for gold in the middle of the desert! What it actually did was spark their gold fever, and L.A. began buying more books and gathering information. Shortly thereafter, they found out about the New 49’ers Prospecting Organization, and joined while they were still in Arizona. With their winter job completed, they first came to Happy Camp, California in late August. L.A. told Brenda on the way up that they might not see a flake of gold for months; that he knew very little about mining; and that he didn’t have any idea what they were getting into. L.A. and Brenda get along with most everybody—making friends easily is one of their assets. One of the 49’er members they became friends with was in the process of abandoning his dredge-hole, because the water was so rough and fast, that it was just “beating him up.” He was leaving a high-grade gold deposit, because he felt it wasn’t worth the beating he was taking to get the gold. He was also selling his dredge, since he was going to work with a larger one that he already had. When he told L.A. about the dredge for sale, and the gold he was leaving behind because of the rough water, well, L.A. just figured it was a challenge, and jumped on in. He bought the dredge, took over the hole; and in just two weeks, he took out four and a half ounces of gold. But, all joking aside, no-one should ever doubt the seriousness of L.A. Lawson. His dream is to strike “the big one!” And by the nature of his approach, he is just the guy to do it! When they arrived back in Happy Camp on the first of May this past year, they had 2-inch, 3-inch, 4-inch, and 5-inch dredges—they were prepared for anything! Looking over the claims early this year, L.A. and Brenda decided they wanted to work a pool beneath a waterfall on one of the New 49’er upper-creek claims. They were told by several people, that usually this is not a good place to find gold. They wanted to find out for themselves, however; so they put their 3-inch dredge in the pool. It was only a small creek, after all. After working as deep as they could with the 3-inch dredge, they still seemed to be a ways above bedrock. They were finding some gold in the overburden, however; so they took the 3-inch out and put in the 4-inch dredge. After working as deep as they could with that, they soon found themselves exchanging it with the 5-inch dredge. They were still finding gold in the overburden, which amazed everyone; and by this time, the others were all watching to see what they found. When L.A. and Brenda finally reached bedrock (at about 13 feet! ), they were working deeper than they should have been, and the gold played out above the bedrock. L.A. and Brenda looked at this as a “learning experience,” and went onto another area, where they also found good gold. They really just enjoyed the “looking”—it was in a beautiful setting, and they were just having fun. They also earned the respect of more experienced miners because the professional way they worked, their hard work and by quitting as soon as they reached bedrock and found no gold. Many an experienced miner has dredged a sample hole they wish they hadn’t started. But once you’ve begun a hole, if at all possible, you’re going to dredge to bedrock! Sometimes this can turn a sample hole into a major production – all for little or no return. L.A. and Brenda spend time finding out as much as possible about an area before working there; but when they finally make the commitment to work an area, they test it as thoroughly as possible. They have concentrated most of their efforts into areas where other people do not want to work—mostly in very fast water, and have done quite well. When they quit dredging, they had accumulated between seven and eight ounces of gold by the end of August, this past season. LA and Brenda have spent a good deal of time testing various types of concentration equipment that other club members had loaned them, to see which worked best in the least time. Adopting the methods that worked best for them, they bought their own equipment wisely. They also liked working with other people on various-sized dredges to see which one was the largest they could comfortably work with. L.A. was working for a short time this past season on another 8-inch dredge; so he turned Brenda loose with the 4-inch dredge in some slack water for a few days to see how she liked it. All the areas he had been dredging in had been in fast water; and although Brenda is an accomplished diver, she prefers water not as turbulent to begin dredging in. Brenda really liked it! She plans to dredge right along with L.A. next year. Brenda is a quiet person until you get to know her; but once she opens up, she makes it clear that she loves the lifestyle they lead–however unconventional it may appear. They feel they were very fortunate to do so well so soon—to have someone put them into gold right away. However, many people would not have worked where they did, to get that gold. L.A. and Brenda have decided that this is what they really want to do, so they have totally committed themselves to finding out all they can about it. They are putting all their efforts into making better miners of themselves. They are enthusiastic, eager, and optimistic in the face of breakdowns, days of finding no gold, and adverse mining conditions. They are thorough, persistent, and run an efficient operation. With all these things going for them, they will do very well as gold miners. They are looking forward to coming back to Happy Camp the first of May next year with a 6-inch dredge, and they’re looking forward to doing some “playing around” with a Mack-Vack this winter. L.A. has made some calls, and has found a winter pipeline job in northern New Mexico. He researched the area, and there are several interesting areas of New Mexico and Colorado where they could do some mining during their spare time. Wherever they go, and whatever they decide to do, you can bet that gold mining and fun will be part of their lives, and that they will be back dredging again next summer!